This a 3/4" spa drain valve. Uses a 2" hole. 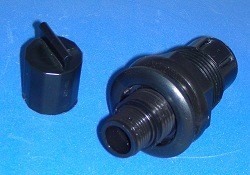 Has male garden hose fitting on the outside and 3/4 slip socket on the inside. Use: With cap in place and valved pushed into the bulkhead (aka tank adapter) all the way, the flow is stopped due to the cap. Pull out the cap (might need to use a pair of pliers if you don't have a lot of finger strength) all the way (about 3", you'll feel it click) and remove the cap. Attached your garden hose to the spigot end. Now push the valve with the garden hose attached into the fitting. The valve will be open and water will start to flow. When done, pull the valve out, take off the hose, put the cap back on, and push in all the way. Done!